Food insecurity appears to be related to weight gain in women. Researchers had already noticed that women in food insecure households were more likely to be overweight. The new contribution in a study by Jerusha Peterman and myself, recently in the Journal of Nutrition, is to use nationally representative data to measure the change in weight over the same 12 month period for which food security status is measured. We found that women in fully food secure households had a comparatively low probability of gaining 10 lbs or more during the year, and women with intermediate levels of food insecurity (such as "food insecurity without hunger") had the highest frequency of gaining 10 lbs or more. Women with the most serious evidence of food insecurity with hunger were back to having a comparatively low risk of gaining 10 lbs or more. What could be going on? Perhaps an involuntary "boom and bust" food cycle due to food insecurity tricks the body's metabolism into retaining calories when they are available. Or perhaps the same resource cycle simply provokes people to eat bad inexpensive food when resources are scarce. Or perhaps both food insecurity and weight gain were caused by some other factor, which we were not sufficiently clever to measure. Because it looks at weight change, rather than just cross-sectional comparisons across people, the study increases the circumstantial evidence that food insecurity leads to weight gain, but it still falls short of proving causation. We don't know why the same pattern didn't show up for men. I got interested in this topic after studying the "food stamp cycle" in my dissertation and later research some years ago. It turns out that a large fraction of people's benefits are spent in the first few days after they are received. I think it would be worthwhile to study policy options such as delivering benefits twice monthly, to see if this approach improves the program's effectiveness in promoting both food security and good nutrition, without deterring participation by imposing undue hardship on program participants. This research also may call into question whether "losing weight" should be one of the 18 items on the federal government's official food security survey. It happens that USDA's Economic Research Service is currently seeking public comment about the content of that survey, with a deadline of June 16 for comment submission (.pdf). I will share my thoughts in a future post, in addition to sending the comments to ERS, but if you are thinking of sending comments, see first the recent National Academies report on the topic for a bunch of context. The Journal of Nutrition paper has received a good deal of press in the past few days. My school's public relations office described the article in a "policy point." The research was summarized in a brief by Sena Desai Gopal in the Boston Globe (scroll past the first article here) and an article by Amy Norton on Reuters. Jerusha is giving a brief presentation of the paper at the annual meeting of the American Agricultural Economics Association (AAEA), as part of a "track" of sessions sponsored by the Food Safety and Nutrition Section, on Monday July 24 in Long Beach, CA. The session (.pdf), which includes other papers on food security measurement, including a briefing about the National Academies Report, is titled, "Hunger in America: A moment of reflection on U.S. food security measurement." Megnut, the long-time weblog by Meg Hourihan, Tufts alum and one of the founders of Pyra Labs (predecessor to Blogger), is now a lively food blog. An amusing feature article recounts her thwarted efforts to compare fresh and frozen fish in a scientifically designed taste test. I'm feeling a little lonely on the topic of the beverage industry's announced plans to give up soda in schools. While pointing out some gaps and shortcomings, I said it looked like a significant concession, whereas previous such announcements had been window dressing. The Center for Science in the Public Interest (CSPI) agreed. Nothing's more important to Clinton than the importance of Clinton, so the deal's announcement put him front and center.... First comes the CEO of Cadbury Schweppes,.... Then comes the CEO of Pepsi,.... Finally comes the CEO of Coke, Donald Knauss. He says of the deal, "We think it's going to strengthen our industry's ability to counter the perception that some of our critics have that some of our products don't fit into a balanced lifestyle." I just about fell off my elliptical machine (all this talk of exercise is highly inspiring) when I saw this. Don, you need remedial PR training! Ask that big white-haired guy standing behind you. Of course you're doing this to counter a perception that could hurt your bottom line. But, for God's sake, don't say that. You're supposed to say something about helping kids or doing what's right. Blurting out the stage directions in your consultant's message memo is very un-Clintonian. It's more like Bob Dole or George H.W. ("Message: I care") Bush. Still want to hear my view? If the deal is just one step forward, let's say so. Don't let folks pretend it's two steps forward. Don't let folks take that step back again quietly next week and pretend that the gesture counts for effort. And yet, if it's one step forward, what message does it send if the public interest folks howl like it was one step backwards? Like stubbornness and intransigence, concessions may be habit forming. I'm just happy to see the soda industry start getting some practice at concessions. It won't be their only opportunity for this new sport. Policymaking initiatives in agriculture and public health are often pursued in a parallel and unconnected fashion. Yet coherent, joint action in agriculture and health could have large potential benefits and substantially reduce risks for the poor. Among development professionals there is growing recognition that agriculture influences health, and health influences agriculture, and that both in turn have profound implications for poverty reduction. This recognition suggests that opportunities exist for agriculture to contribute to better health, and for health to contribute to agricultural productivity. To take advantage of these opportunities, however, it is crucial to understand the precise linkages between the two sectors. How do the linkages work? Where do opportunities for joint action lie, and what are the impediments? How can the agricultural and health sectors work together more closely and thereby contribute to addressing poverty? Many readers probably already subscribe to the weekly news digest on hunger policy issues from the Food Research and Action Center (FRAC), the leading advocacy organization for food assistance programs at the Federal level. USDA's new food stamp radio public service announcements for the Food Stamp Program, in English and Spanish. USDA's partnerships with the Friedman School of Nutrition at Tufts and other organizations, to promote awareness of the Dietary Guidelines for Americans. Parents' efforts to protect children's recess time. A study of the fruits and vegetables that participants bought with innovative WIC vouchers. And that's just a small part of just one week's edition. The Food and Drug Administration (FDA) on Friday posted to the internet the actual data behind its finding of benzene in certain sodas and beverages, which contain both ascorbic acid (vitamin C) and benzoate salts (such as sodium benzoate). Benzene is a carcinogen. Some of the highest benzene counts were for one lot of Crystal Light Sunrise Classic Orange, with more than 76 parts per billion (ppb), and a lot of Safeway Select Diet Orange, with 79 ppb. Because of the limited survey data to date, we cannot yet understand the sources of variation in measured benzene levels, such as variability between different product lots and the effects of storage and handling. For example, although one sample from a production lot may contain elevated benzene levels, it does not mean that all the products from that lot will have elevated levels, or that all lots of a given product will contain elevated levels. In other words, BE VERY REASSURED. It is possible that the orange soda your child is drinking has less benzene. Leave it to the Environmental Working Group to point out that the benzene counts for the two worst lots are about 17 times the safe level limit for benzene in drinking water. 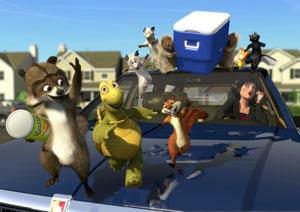 Over the Hedge: "For humans, enough is never enough." "These guys live to eat," explains RJ [a raccoon]. Leave it to a raccoon to condense the lessons of Fast Food Nation into a monologue worth the price of admission. Parents, school officials, and community members around the country this Spring are working on "school wellness policies." As part of reauthorizing school lunch and school breakfast programs in 2004, Congress asked local districts to establish their own standards for snacks and beverages in schools, recess time, food at fundraisers, and so forth. I have been serving here in Arlington, Massachusetts, on the Wellness Policy Committee that is drafting the policy. Then, the policy will be submitted to a subcommittee of the School Committee, and some time in June will be considered by the full committee. In our town, key contributors to the draft policy have included: (a) the chair of the Wellness Policy Committee, Cathryn Cremens-Basbas, who is also the physical education director for the school district and leader of a great community wellness program called "Activate Arlington," (b) other school officials including the head of the nutrition and home economics program, the school food service director, and many others, (c) School Committee members who contributed much time and service to the Wellness Policy Committee, (d) senior school administrators, including the superintendent and influential principals, who have not been heavily involved in the Wellness Policy Committee meetings, but who will greatly influence the final outcome, and (e) parents, many of whom have organized themselves into an active local chapter of a children's advocacy organization called Stand for Children. Review the draft Wellness Policy and send any feedback to Judy Neufeld by May 23rd! Meet with a stakeholder group to gather feedback and gain support for the Wellness Policy. If you are interested, email Judy Neufeld. See toolkit below for resources. Attend the Open Forum on the Wellness Policy to provide feedback on May 22nd at 7pm, Robbins Library Community Room. Attend the School Committee meetings on June 13th and 27th to show your support of the Wellness Policy. Stay tuned for more information. To get involved, contact Judy Neufeld, Organizer, (781) 698-9448 or send email. Join Stand for Children, or renew your membership as a Sustaining Member! Some things give me hope for a strong wellness policy in Arlington. The draft policy seems quite good, and fairly well meets the three key priorities that the Stand for Children chapter identified -- a strong implementation component, a policy about adequate time for children's lunch, and an effort to rein in "competitive foods," which compete with the federal school lunch program. The draft also has good policies on nutrition education and health education, which are less controversial. At the same time, I have many causes for concern. The school district is under great financial stress, because it relies on local taxes for funding and, as part of a deal about a tax override a year earlier, there can be no tax increases in the next few years. Furthermore, in making budget cuts, the superintendent and School Committee have perhaps wisely (sigh) placed priority on protecting classroom teaching staff and "consolidating" -- partly a euphemism for cutting or reducing -- some administrative positions that will be important for wellness. These cuts have severely affected the positions of several of the key school officials on the Wellness Policy Committee, which means that their continued service and energy on that project really represents a remarkably selfless gift to the community. Another concern is that many people I have spoken with agree with most of the policy, but dislike one plank -- and it is never the same plank. For example, one parent likes the effort to get rid of competitive foods, but doesn't like the possible limitation that only healthy food would be sold at intermission for school plays, because the bake sale at that time is a cherished activity for her. Another person, with experience in school counseling, likes most of the policy but opposes the plank that prohibits denying recess as a punishment, which removes a discipline option that some counselors and teachers value. I fear that in the next rounds of revision, the policy may get stripped plank by plank, even if most planks of the policy have support from most people in the community. The school district leaders on the Wellness Policy Committee and the Stand for Children chapter collaborated in April on a training for people doing community outreach about this policy. For example, parents who were trained may be meeting with sports booster groups that have traditionally had food and beverage fundraisers, to see if the booster groups might generously support the policy on principle, even though it requires a sacrifice on their part. The training included great presentations by two graduate students from the Friedman School of Nutrition at Tufts, Sonya Irish and Erin Hennessy. I hope these community discussions will build support for a true big step forward for the nutrition and wellness of the next generation of children here in our town! Please offer comments. If you are from Arlington, say so in the comments, so I can include your comments in a summary of public input that I am preparing next week for the Wellness Policy Committee. Retailers in Michigan are asking the state food stamp agency to consider distributing food stamp benefits differently, according to an AP article today by Sarah Karush (via Boston Globe). In Michigan, each of the 512,000 households -- 1.1 million individuals -- on food stamps receives them within the first nine days of the month. The funds are transferred electronically onto a debit card. Most states stagger distribution, though eight states issue everyone's benefits on the first of the month, according to the U.S. Department of Agriculture. Of those that stagger, the number of days varies from three in Connecticut to 22 in Missouri. Tom Wenning, general counsel of the National Grocers Association, said staggered issuance took hold as a way "to provide some relief both for the consumer and the retailer." But many Detroit retailers say the nine-day spread is not enough. The Associated Food and Petroleum Dealers of Michigan wants the state to divide each recipient's food stamps into two payments per month -- which federal law allows for, but no states currently do. The monthly food stamp cycle is an issue that colleagues and I have been working on for several years (see here, here, and here, and email me if you would like me to send an electronic copy of the full articles). In addition to staggered benefits, Karush's article today also discusses benefit delivery more than once monthly. It says advocates for participants in Michigan opposed distributing the benefits twice monthly. However, there is a strong pro-participant case to be made for at least investigating such a policy. Now that benefits are distributed electronically, through debit cards, there is little administrative cost to delivering benefits twice monthly. It might help participants avoid "boom-and-bust" food cycles that harm food security and nutrition at the same time. Indeed, one may speculate that such cycles could be related to both hunger and risk of overweight and obesity. In focus groups, some food stamp participants have recommended benefit delivery twice monthly (and I presume they weren't just hoping this meant double benefits!). Participant reception of such a policy is an open empirical question -- it seems quite possible that such a policy would solve a problem for retailers and participants at the same time. The folks who organized the Eat Local Challenge last year (earlier post) have an even more interesting project this year -- a group weblog by and for people who are exploring the joys and limitations of their own personal local purchase disciplines. The local eating movement has its detractors. For example, the global culinary perspective from the weblog Too Many Chefs: "There's a movement afoot to eat only food made with local ingredients prepared simply.... To this, I say 'Phooey!'". Half Changed World argues that other environmental choices -- in particular the choice of where to live, what to drive, and how much meat to eat -- matter more than the local origin of one's food. [T]he idea that you can save fossil fuels by not transporting food long distances... is a widespread belief, and of course it has some basis. Other things being equal, if your food is grown locally, you will save on fossil fuels. But other things are often not equal. California rice is produced using artificial irrigation and fertilizer that involves energy use. Bangladeshi rice takes advantage of the natural flooding of the rivers and doesn't require artificial irrigation. It also doesn't involve as much synthetic fertilizer because the rivers wash down nutrients, so it's significantly less energy intensive to produce. Now, it's then shipped across the world, but shipping is an extremely fuel-efficient form of transport. You can ship something 10,000 miles for the same amount of fuel necessary to truck it 1,000 miles. So if you're getting your rice shipped to San Francisco from Bangladesh, fewer fossil fuels were used to get it there than if you bought it in California. In fact, if you read closely, the tone of the Eating Local Challenge authors survives this second guessing quite well. Their weblog is nicknamed the ELC, not the ELR ("Eating Local Religion"). I may be too much of an economist to adopt a strict discipline, such as the 100-mile diet, but I am loving the ELC weblog. About 20 percent of U.S. food sales are in Wal-Mart alone, the New York Times reported last Fall. In the last five years, Wal-Mart has emerged as a dominant force in the grocery business, selling almost twice the amount of food and grocery items as Kroger, the country's largest supermarket chain. Wal-Mart undercuts supermarket prices by as much as 20 percent but is still able to generate considerable grocery profits because of its enormous volume and huge buying power. Wal-Mart's labor costs are also lower because, unlike workers at most supermarkets, its employees are not unionized. "Wal-Mart just keeps growing," said David B. Dillon, chief executive of Kroger, which regularly compares the performance of its stores against Wal-Mart Supercenters. "And I don't see any signs of a slowdown in the number of stores." Wal-Mart started with its first store near Bentonville, Ark., in 1962. The diffusion of store openings radiating out from this point was very gradual. And this diffusion didn't just occur in one direction, but spread out in all directions, with the same measured deliberation. Imagine a slowly blooming flower, or a pebble dropped in a pond, with the waves moving across the water in slow motion. It is very helpful to view a movie [below]of the entire year-by-year diffusion path. Thanks to Marginal Revolution for the link. Credit Thomas J. Holmes for the fascinating movie. Hi Parke. In response to your post today--did you see the article, also in the New York Times, about WalMart focusing hungry eyes on the organic market? Im pretty sure it was up yesterday. I'm a big fan of Michael Pollan's guest blogging on the NYT site and look forward to seeing him next week at the brattle as part of his book tour. I think Jack from Fork & Bottle may have also pointed out the link about organic foods at Wal-Mart. The Pollan weblog appears to be by subscription only. Also, while looking for the New York Times link, I found this awful story about Wal-Mart buying favorable coverage from bloggers. Update 2 (May 14). Mark from CalorieLab points out that the New York Times article about Wal-Mart public relations does not document webloggers accepting bribes. Rather, what I called "buying favorable coverage" means hiring an online public relations expert sufficiently persuasive to find webloggers who are willing to reprint Wal-Mart's views as independent opinions. In the Feb. 10, 1906 NYT The Jungle by Upton Sinclair was announced on page 85 of the NYT Book Review in a four paragraph one column how-do-you-do. In the May 3, 1906 NYT, Mr. Sinclair offered a letter to the editor asking for a chance to prove his claims about tainted meat and other bad practices outlined in his book. He suggests that a lack of a lawsuit against him by Armour suggests that the charges Sinclair levels must be true. CHICAGO - Arthur Meeker, the only person authorized to speak for J. Ogden Armour. says he cannot say what Mr. Armour will do about Upton Sinclair's challenge to him to bring a libel suit to test the truth of Mr. Sinclair's charges that spoiled meat is willfully put on the market in various forms at the Armour packing houses here. There is not much likelihood that the firm will notice Mr. Sinclair's attack. Mr. Armour is in Europe. Career appointees at the Department of Agriculture were stunned last week to receive e-mailed instructions that include Bush administration "talking points" -- saying things such as "President Bush has a clear strategy for victory in Iraq" -- in every speech they give for the department. The funniest part of the column is an attachment that USDA officials are supposed to use as a template, showing how easy it is to change any speech topic to a commentary on our success in Iraq. Several topics I'd like to talk about today -- Farm Bill, trade with Japan, WTO, avian flu, animal ID -- but before I do, let me touch on a subject people always ask about... progress in Iraq. So, before I begin talking about the civil rights climate at USDA, I'd like to address the situation in another nation that is just now forging the path to democracy. But, before I begin discussing the productivity of American agriculture, I'd like to take a moment to talk about a nation that is just beginning to build its own agricultural production. Thanks to the work of [Private Voluntary Organizations] like Visions in Action, Techno Serve, and the World Council of Credit Unions, the program is helping farmers in Liberia, Honduras, and Sri Lanka. And USDA-donated corn and soybean meal is helping to revitalize the Iraqi poultry industry. This is the kind of work that rebuilds livelihoods, lives, and nations. And it contributes to the Global War on Terror. I am sure these organizations will be proud of the credit they get in these speeches. Let us know in the comments if you witness any of this public communication strategy in action. Tim Wise deserves space for a full and thoughtful rebuttal, following our post last week about his report entitled, "Will the Doha Round do more harm than good?." The report's on-line summary had contrasted the net gains to developing countries from the Doha Round trade agreement with the tariff losses these countries would face. I wrote, "Do the authors compare projected net gains from trade to tariff revenue losses? If so, that would be misleading." I'm afraid Parke Wilde may have misconstrued the point of our comparison of estimated net gains from trade liberalization with tariff losses for developing countries. The point was not that the two numbers are directly comparable, as on a true balance sheet. Rather, the point was that the net gains estimated by the trade models include a host of hidden costs that are effectively assumed away in the modeling. One of those is losses in government revenues from reduced or eliminated tariffs. How are they assumed away? The models assume fixed fiscal balances, which means in practice that such losses in government revenue are assumed to be made up in lump sum taxes. In developing countries, where governments on average get about 20% of their revenues from tariffs and where the infrastructure and income base for taxation do not yet exist, that is an absurd assumption. (It's pretty absurd for other countries as well, including the U.S. When was the last substantial tax increase happily approved by our government?) So the "net gains" account for the tariff losses, they just do so in a way is unrealistic and that makes them invisible. Our goal was to make them visible. For a developing country negotiator evaluating his/her country's prospects under the proposed WTO agreement, pulling out those hidden costs from the modeling is very germane to the decision. Comparing those hidden costs to the small projected income gains from such an agreement is a simple and clear way to put such numbers in meaningful perspective. Countries are not oil companies, and their "management" does not run in any direct way on their "profits" from economic activities. Signing away 20% of your government's operating income in a trade agreement that promises only limited income gains may be a good economic decision in some extreme circumstances, but it should be one made with the full knowledge of its costs. Meanwhile, if you like the "fixed fiscal balances" assumption in the modeling, you'll love the "fixed employment" assumption, which ensures that in the modeling world if not the real world, trade liberalization can't cause unemployment. The beverage industry, in conjunction with the Clinton Foundation, today is announcing new voluntary restrictions on sales of soda and high-caloric drinks in schools, the Washington Post (here and here) and Associated Press (via USA Today) reported this morning. I covered earlier voluntary restrictions by the American Beverage Association with much skepticism, but the new steps actually appear to have some teeth. At first reading, strengths include voluntary restrictions even on diet sodas and smaller serving sizes even for fruit juices in elementary schools. In elementary schools, these steps are important, because of manipulative marketing to build brand loyalty in young children, and the caloric content even of fruit juice. I think, in modern America, for middle schoolers and high schoolers, the solution to manipulative marketing may be to teach the students sufficient skepticism to undermine the marketing, rather than formal restrictions. The policy announced today, one day after the release of an FTC report on food marketing to children, would take effect only slowly over several years. Sales of drinks other than high-calorie sodas at high schools would remain permissive, and there would be no limits on sales of sugary sodas at school related events in the afternoons and evenings. Still, with my fingers crossed that I haven't been fooled by something I missed, I must admit to being impressed by today's announcement. It is one step forward, on one of the leading areas of concern for children's nutrition today. The Federal Trade Commission (FTC) today released a report on food marketing to children and childhood obesity. The report calls for voluntary efforts by the food and advertising industry, along with mild changes to the the industry's self-regulation procedures. The reception from advocacy groups concerned about marketing to children was negative. Gary Ruskin of Commercial Alert called the FTC report "a candy-coated present [for] the junk food industry." Given the blandness of today's report, what may be more interesting is a forthcoming report that the FTC is preparing for a July 1 deadline, at the request of Congress. For that new report, FTC may request advertising industry research that has been proprietary. An Institute of Medicine report on marketing to children noted that the public research record on the effect of advertising is weak largely because the relevant proprietary research has not been shared. The FTC took public comments on its plans for that new report this month and recently published them on the agency website. These public comments indicate the powerful advocacy coalition that keeps the FTC's hands bound firmly behind its back. Here (.pdf), for example, is the comment from the Promotion Marketing Association (described as "the leading trade association representing the promotional marketing industry"). Furthermore, PMA remains deeply concerned with First Amendment implications of any additional regulation that would unduly curtail non-deceptive and non-misleading practices in this area. The restriction of children’s food advertising, no matter how truthful, merely to satisfy those who might criticize any advertising methods, runs a serious risk of being more restrictive than necessary to achieve the government’s intended goal of protecting American children, all in violation of First Amendment jurisprudence. PMA remains firmly committed to participating in this debate and aiding the Commission in the task assigned to it by Congress. If the Commission engages in any further inquiry on this topic, PMA wishes to participate fully in any Commission initiatives. I am sure PMA will get to participate fully.